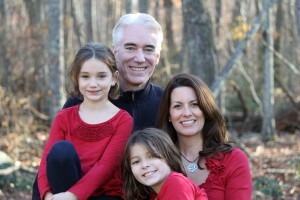 Ken Sullivan and Michelle Palomera with their daughters Leah (left) and Abby. Ken Sullivan’s diagnosis of Alzheimer’s disease at age 47 unleashed a torrent of feelings: shock, isolation, fear. It’s probably why he lost his demanding job at a large financial company. The diagnosis was also emotionally devastating for his wife, Michelle Palomera. But for both of them, it was a rude awakening to the myriad financial preparations required for Alzheimer’s. Even though both are financial professionals, they had no idea how complex it would be to revise their existing financial plan, how hard it would be to find professionals with the specific legal and financial expertise to help them, or how long this project would take – 17 months and counting. “This disease has so many layers and aspects to it,” Palomera said. The risk to an older individual of getting Alzheimer’s is only 10 percent – and early-onset like Sullivan’s is even rarer. But when there is a diagnosis, one issue is the lack of a centralized system for managing care and coordinating the myriad professionals and organizations involved. These range from the medical people who diagnose and treat an Alzheimer’s victim to health insurers, attorneys, social workers, disability and long-term care providers, and the real estate agent who may be needed if a victim or the family decides they can’t remain in their home. Sullivan and Palomera had always shared their family’s financial duties. But Sullivan’s new struggles with details and spreadsheets left these tasks entirely on Palomera’s shoulders – all while juggling her job as a managing director for a financial company. “If something were to happen to me, I have to be really air tight on having everything squared away so the trustee – someone – can manage the situation for our daughters and Ken,” she said. After Sullivan’s June 8, 2013 diagnosis, the couple called family to gently break the news. Their next calls were to a disability attorney and a financial planner. They’ve since gone through four estate attorneys to find one who could answer their questions and suggest the best options for themselves and daughters Leah, 9, and Abby, 11. Questions revolve around trusts, long-term care costs, and whether to file for Medicaid or technical divorce. For example, if something happens to Palomera, the couple established trusts for their daughters to ensure they’re taken care of. Sullivan and Palomera used to hold durable powers of attorney and healthcare proxies for each other, but Palomera had to assign this to someone else. Before his diagnosis, Sullivan felt that something was amiss. A senior vice president for a Boston financial company, he became forgetful in meetings and withdrawn from the employees he managed. Palomera noticed he was forgetting to pay credit card bills he’d always been on top of. For months, they wondered whether he was suffering early-onset Alzheimer’s or garden-variety stress, as one emergency room doctor speculated. They also did not know which tests their health insurance would cover and then endured a primary care physician who incorrectly told Sullivan that his spinal tap test for Alzheimer’s gene markers was normal. An immediate financial issue was a decline by about half in the family’s income after Sullivan’s layoff. This transformed their lifestyle from very comfortable to very frugal. The first thing to go was a plan to decorate their home in Scituate, a stylish suburb on Boston’s South Shore. Palomera lists the things they can no longer afford: shopping for nice clothes, saving for retirement, and traveling to Europe – they visit friends instead. “We really just buy what we need, not what we want,” she said. They’ve also pared back saving for their daughters’ college educations, and they must hire a baby sitter when Palomera has out-of-town work. Their daughters receive Social Security benefits due to their father’s impairment, which qualifies him for federal disability assistance. Although Sullivan looked for a new job after his layoff, he said he no longer feels up to working. To stay active, he runs the family’s errands. He is also a national early-stage advisor to the Alzheimer’s Association and volunteers at the Friendship Home, which helps children with Aspergers and Down syndrome. “Instead of feeling sorry for myself, I have chosen to raise awareness of the disease,” says Sullivan’s testimonial promoting a walk in Plymouth, Massachusetts, that he helps organize to raise funds for Alzheimer’s. A large and lurking financial issue for the couple is paying for long-term care if Sullivan becomes incapacitated. They are too well off to qualify for Medicaid, which funds care for Americans who lack financial resources. The cost for a skilled nursing facility averages $5,750 per month but can reach or exceed $10,000, according to Genworth. An attorney helped them apply, successfully, for long-term disability through Sullivan’s former employer – it pays 60 percent of his former base salary, excluding bonuses. Rather than use these payments to shore up their immediate finances, it’s being saved for Sullivan’s future care. Thank you for this well written and compassionate article. I admire the bravery of Sullivan and Palomera to address the financial challenges while dealing with the personal and family issues. I hope that the blog might follow this family, if they would be open to continuing to share their experience. Thank you for the wonderful idea – the couple were remarkable people and would be worth following up with, if they’d agree. Impressive commentary. I noted that they went through a number of financial planners before they found one who could cover off their needs. Not unusual. And had poor medical advice. Michelle understandably had to provide direction when she had obligations and responsibility. This would be stressful for anyone. Many would not survive all of this but I think this family will. All the best. God Bless them.